Jimey (rhymes with Eye Me!) the Woodpile Mouse is a beautiful, kind, and one of the most reassuring stories I’ve ever read. It is so well done that it stays with you long after you’ve read it, quietly reminding you not to worry because everything is going to be okay. My eldest son adores Jimey and we’ve read it a countless number of times. It is a family favorite and one that I’m always up for reading! Published By: Pine Alley Press, 2014, Fiction. 48 pages. ISBN:978-0990353904. Jimey loves the woodpile where he lives. It is so cozy and gives him everything he needs — it keeps him dry when it rains, warm when it is cold, and safe from Farmer Karson’s cat, Kloee. However, as the weather gets colder, the woodpile starts to shrink! That’s when Jimey’s worries start, too. What is he going to do when the woodpile is gone? Certainly Kloee the cat will catch him! The night before the woodpile is set to run out of wood, Jimey cannot (understandably) sleep! All he can do is worry! But to his great surprise, when he wakes up the next morning to a rumbling and crashing sound, Jimey finds that his woodpile isn’t gone — but it is larger than ever! How can this be? Who is looking out for him? The answer is truly delightful! The art alone is disarming and enchanting. The brightly colored, digitally impressionistic landscapes juxtaposed with black and white mouse and cat are inviting, invigorating, and instantaneously accessible to even the youngest readers. I didn’t realize that there was a cure for worry — and the prescription is to read this book, as needed, to assuage young and old worriers alike. I love, love, love this book. Jimey the Woodpile Mouse is as sweet as a deep breath in a frantic moment that leaves you smiling, grounded, and reminded that there are wonderful, incredible people in this world doing lots of amazing things to help make the world a better place. At the end of the hardcover edition there is a game. You look at the pictures with single words written underneath, and then you go back through the book and find those pictures. It is a fun seek and find exercise. This book is so happy! It lets you become Jimey the mouse and live his life. You have his same joys and share in his same worries. Then you get to experience the joy when he finds out that everything is going to be alright. 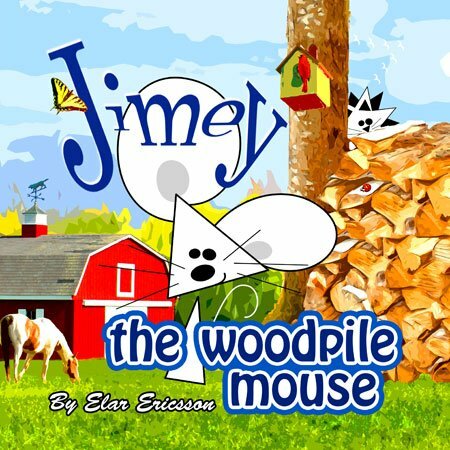 To quote one of my wise and learned heroes, LeVar Burton, “But you don’t have to take my word for it.” you can read Jimey the Woodpile Mouse online right now for free. [Library] Woldcat.org — ask your library to order it! [Online] You can read the whole book for free. Your enthusiasm sold me on this book. It sounds charming and a feel-good book. Love the cover! Am surprised its 48 pages —unusual for a picture book. Aw, I empathize with sweet Jimey. I hadn’t thought of a mouse living in a woodpile. That’s a rather interesting cover! I think we have mice in our woodpile. But I think snakes are more likely to get them than our cat! Yikes! Poor worrying Jimey! I’ll have to check out his story! Thanks! My pleasure! I hadn’t thought of snakes — yikes is right! This is such a sweet story — I hope you get a chance to read it and enjoy it! This looks clever – and fun, with a great message. Thanks for sharing! My pleasure! Thank you so much for stopping by! I hope you get a chance to read Jimey! It is a sweet book. I guess this book addresses worry or anxiety a little more obliquely than the book, Wemberly Worried. It sounds lovely. I’ll have to take a look. I don’t think Jimey would elicit such sympathies if he had been the pantry mouse. 🙂 I haven’t read Wemberly Worried. I’ll have to check it out. I haven’t read a lot of books that address worrying directly — so I look forward to reading it. Tiffa, I love Seek & Find Books 🙂 I always have loved that kind of stuff, ever since the Hidden Pictures in Highlights Magazine when I was a kid back in the 60s! Still love them, actually. Ever done them online? Oh goodness! I haven’t done them online before. That’s a great suggestion! Thank you!